By winning their fourth straight game with a comeback effort over the Jets on Sunday, the Carolina Panthers have moved into a tie for first place in the NFC South with the New Orleans Saints. Cue the huge matchup pitting these two teams against each other on Sunday, one that is sure to captivate those paying close attention to NFL betting odds for the season. Things are just clicking for the Cats right now. 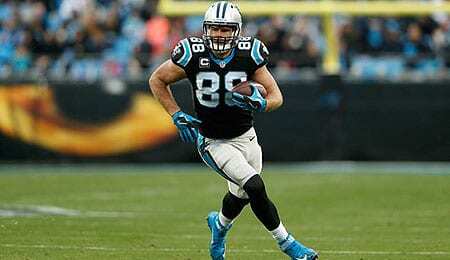 Even with tight end Greg Olsen returning from a broken foot on Sunday only to be pulled at halftime as the foot was again giving him problems, the team still found a way to pull out another W.
Luke Kuechly played the hero on Sunday, returning a fumble 34 yards for a touchdown to give the Panthers a fourth quarter lead they’d never relinquish. As for Olsen, as recently as 2015 he was fourth in our Tight End Rankings. Last year, he finished fourth in Fantasy points at the position, so his loss in Week Two was massive. Yet, Carolina just kept winning. Olsen only managed one reception (see video below) on four targets before getting yanked on Sunday, and there have been conflicting reports about his practicing this week, so make sure you check the injury reports before deciding whether he’s worth using his weekend. If he can go, that’ll really help the passing attack. It’s been defense, led by a confident veteran group, that has really helped drive this win streak for Carolina. This unit will have its hands full this weekend, facing a New Orleans attack that has racked up the second most yards in the NFL. Kuechly, whose fumble recovery was set up by a strip-sack by DE Wes Horton, was named NFC Defensive Player of the Week. Besides the fumble return for a TD, Kuechly had 10 tackles, including one for a loss. He’s now won five Defensive Player of the Week awards, a new franchise record. Special teams also played a big role in Sunday’s win, as Kaelin Clay returned a punt 60 yards to the house to put the game out of reach, 32-20, with 9:54 left. Speaking of Clay, he could see more snaps and targets this weekend if No. 1 receiver Devin Funchness (toe) can’t suit up. Funchness missed practice on Wednesday, and considering how many targets he’s been getting (a season high 12 on Sunday), that’ll create some opportunity among the rest of the receiving corps if he’s out. The Panthers haven’t done a great job of taking advantage of their opponents’ mistakes this year, but that sure changed Sunday. Having the D and special teams come up huge worked out well as QB Cam Newton was not at his best by a long shot. Other than a rushing touchdown, it was a pretty lost day for him as he only completed 11 passes out of 28 attempts for his worst percentage of the season — by far. In fact, it’s been almost a year since he had a worse completion percentage. Newton has been beat up with little injuries all season, but nothing that has sidelined him. Still, we’re sure he’s itching to put up a better showing than last time (Week Three) against New Orleans, when he had his worst game all season. While he hasn’t been as good as his career year in 2015, Newton has generally been better than last season, and certainly a completion percentage over 60 per cent suggests as much. But for Carolina to beat New Orleans on Sunday, he’ll need to be better than he was against the Jets. Suddenly, the NFC South is the division to watch. And remember that Atlanta is just a game behind these two, so if the Falcons beat Minny on Sunday, they’ll be tied with the loser of the Panthers-Saints matchup. With the playoffs just around the corner, this is going to be fun finish in this division. Buckle up, peeps. Now it’s your turn. Let us know in the comments below how you think this Carolina-New Orleans game will go on Sunday.